I am so tired. NerdCon Stories on Friday and Saturday was a blast. I will do a whole post on that tomorrow. The only sad thing about NerdCon was that the weather this weekend has been incredibly gorgeous. It was 70F/21C yesterday and I spent it indoors! What a great day it would have been for a long bike ride, but alas, Astrid sat lonely in her corner. Today would have been a great day for a ride too, 83F/28C in the middle of October! Most unusual for us and I believe we are going to break a temperature record today. But there was no ride because wind. Also because I had a lot to do from not being around for two days. Things like household chores. Also stuff in the garden. Bookman has spent most of the day in the kitchen baking bread, cooking pumpkin, and other sorts of kitchen wizardry. We have been so busy we didn’t get a chance to work on the chicken coop this weekend. An unfortunate thing because next weekend is not going to be so nice but a more seasonal 50F/10C. Not much that can be done, we are only two people and there are only so many hours in a day. Even though the temperature doesn’t feel like autumn, it is looking more like autumn these days. Melody Maple Tree is a lovely shade of green, red and yellow right now. And Hazel Hazelnut is blushing a beautiful pink/red. While Witchy Poo Witch Hazel is looking charming in bright yellow. The asters are still going strong and the arugula in the vegetable garden bolted a few weeks ago and is covered in cheery little yellow flowers. The quality of light this time of year is gorgeous, golden and sparkly. And even in the morning it looks like late afternoon so I am always getting confused about what time it is because the light always looks like it’s 6 o’clock. But sunset these days is around 6:30 so when it really is 6, it seems like it should be much later. Even though it happens gradually, the shorter days always take me by surprise. I am still not used to it being dark when I leave to catch the bus and train to work in the morning. Before I know it, the sun will be setting on my way home in the evenings. I won’t be able to get my vitamin D naturally anymore and will have to start taking supplements for the winter months. I picked another pumpkin today, a lemon squash, and more cowpeas. There are still tomatoes in the garden and some zucchini too. The chard is still going strong as well. I think chard is my new favorite summer green. It has gone all summer and not bolted. We’ve been using it like spinach, cooking it up in stir fries and casseroles and tonight it is going on some pizza. My chard is the regular green kind, not the rainbow kind, but it is still really nice and the bugs haven’t bothered it much at all. Chard for the win! Did some much needed weeding in the garden today too. There is still more to do, there always is, but this time of year it is more a part of getting ready for winter than it is to keep the beds clear for the growing season. There might be a light frost this week and then we will be able to begin preparing for winter in earnest even if it isn’t exactly a hard, killing frost. picks and tosses the apples down to me. Some of the apples this year are so big I could have used a catcher’s mitt. 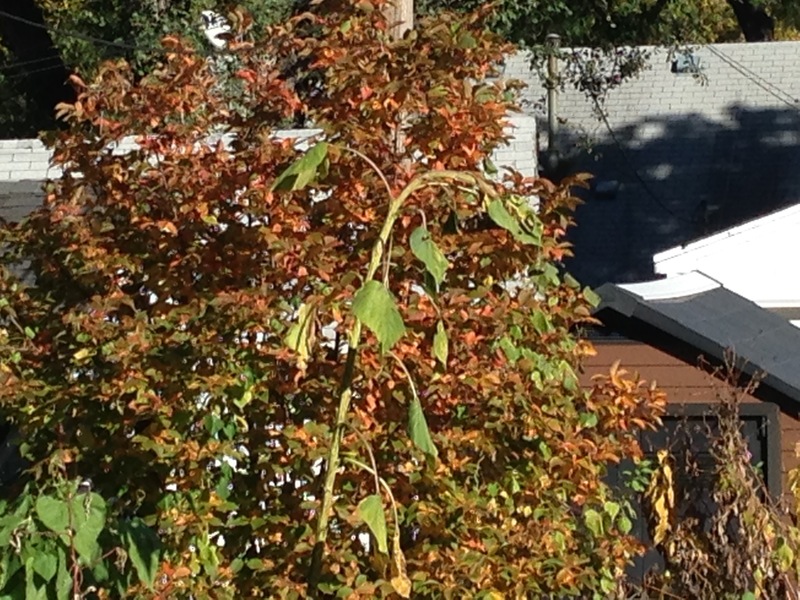 There is probably still another 5-gallon orange bucket’s worth on the tree that we will get to later this week. 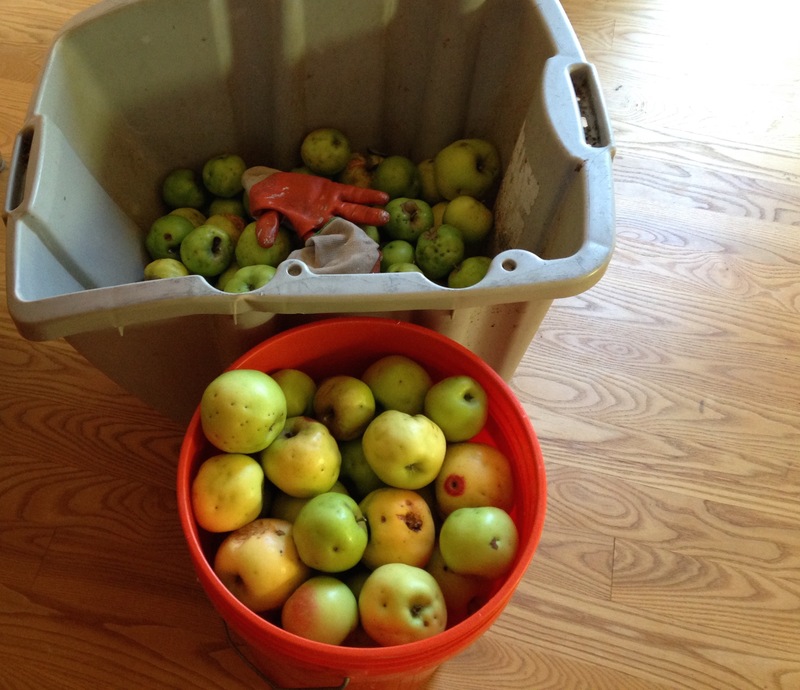 We’ve already picked and canned quite a few jars of applesauce and apple butter and Bookman made an apple crisp too. We’ll be making a few more jars of sauce and butter and then we will can a couple jars of apple pie filling. Yum! Bookman is also going to attempt to make apple jelly from the cores but with a lot less sugar than got added to the crabapple jelly. We tried to eat the crab jelly but it was far too sweet and thick from all the sugar the recipe told us to add that we had to give up on it. So we’ll see how apple jelly goes. We wake, if we ever wake at all, to mystery, rumors of death, beauty, violence. Look at those apples and how wonderful that you are able to reap so much fruit/veggies from your garden. Hope you’ll still have a few good weather days so you can take Astrid for some long rides. Iliana, It is really nice that we can grow so much. We could grow even more if we had more time to spend in the garden but those pesky bills need to be paid! I am hoping for a few more nice days too! Fingers crossed! Can’t wait to hear more about NerdCon! We had beautiful weather this weekend as well, and I tried to enjoy as much of it as my schedule would permit. I spent several hours outside in the lovely coolness sunning my hair and reading and writing, and it was absolutely smashing. AUTUMN. Jenny, sounds like you took full advantage of the nice weather. It is such a great time of year, isn’t it? We’re getting beautiful weather here too, but definitely with a chill. So looking forward to your NerdCon post! Ana, beautiful weather for everyone! How often does that happen? Dilliard is such a poetic writer! Already looking forward to your NerdCon post tomorrow now that I know it’s all about stories. And, have you ever tried apple chutney? Cath, I have not tried apple chutney but it sounds delicious. Do you have a favorite recipe? It’s a while since I last made it, will translate and send the recipe to you later this week. I’m not surprised you’re tired – that NerdCon agenda looks packed. BookerTalk, packed is right! Plus being in a big crowd all day for two days when you aren’t used to it is its own special kind of tiring. And having to keep smiling, nodding and engaging in intelligent conversation for that length of time! I’m not a great one for winter as you know, but I do LOVE autumn (fall) and especially apple crisp. Crisps/crumbles are the first things I make when the weather turns, well, crisp!